In Article No. 139, I mentioned that I would try to get a picture of a Golden Crowned Warbler. Well, I got two good shots of the bird taking a bath but my ISO setting was too low and the photos turned out too dark. I did what I could with my computer to improve the photos but there are limits. As a result the pictures are not the best but the field marks of the Golden Crowned Warbler are clearly visible (yellow crown patch bordered with black). Check Article No. 139 on my website for the pictures. If I get any better pictures I will replace the present ones. Last year in Article No. 107 I wrote that this part of the continent has many more different species of pigeons as compared to Canada. 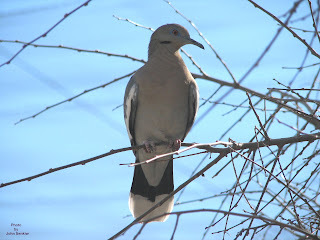 To emphasize the point I decided to feature another member of the pigeon family this week, the White Winged Dove. 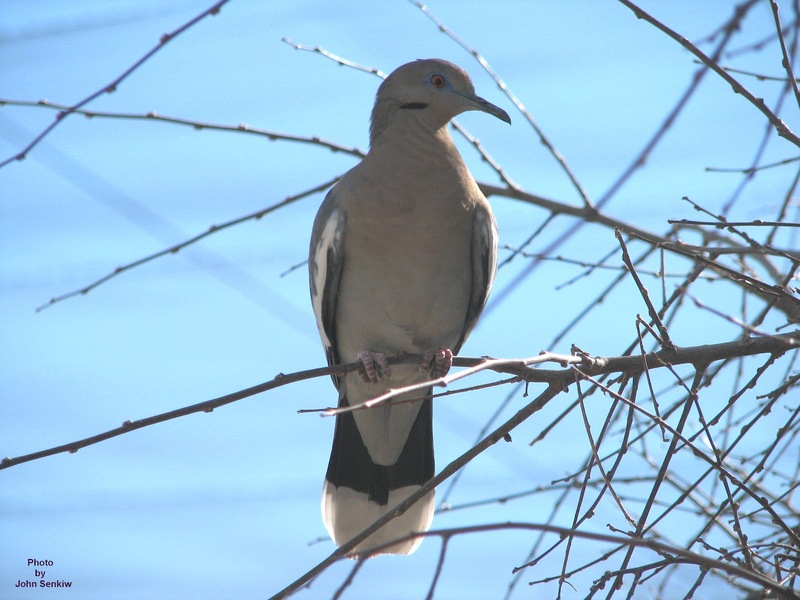 The White Winged Dove is common throughout the south from the Atlantic to the Pacific. It is a well-known wanderer that has been recorded as far north as Canada. Generally, it migrates to the tropics for the winter but a few always stay around on their summer grounds, especially in Florida. In colour and size the White Winged Dove looks much like a Mourning Dove. The White Winged is bulkier with a shorter tail but these differences are moot in the field whether the bird is perched or in flight. In flight the tail of the Mourning Dove is more sharply pointed than tail of the White Winged but both have noticeable white spots along the tails’ edges. Only an experienced birder can really use tail differences for identification. The one good field mark is the white on the wings of the White Winged which is visible whether the bird is perched or in flight. The Mourning Dove has no white in the wings at all just black spots that are clearly visible when the bird is perched. A vocal dove is very easy to identify. Whereas the Mourning Dove utters three to five coos, the White Winged utters a hollow, “Who cooks for you”. To me it sounds like a pigeon trying to crow like a rooster. I cannot recall taking this week’s picture but I do know it was in Arizona in 2008. The white wing flashes are clearly visible.